Our adventure of the day today was mountain biking in Moab, Utah! We set out for a beginner mountain bike trail and found one just about two miles from our campsite on Mill Canyon Road. 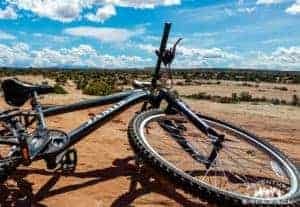 The trail is called the Monitor-Merrimac Trail, and is about 13 miles north of Moab. The trail was great and we had a wonderful time! 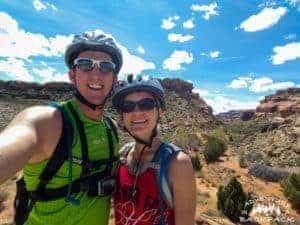 Since Steph is a beginner at mountain biking and neither of us have been on our bikes in over a year, we wanted to find a beginner mountain bike trail that would still offer some challenges as well as some great scenery. We found that with the Monitor-Merrimac Trail (http://www.mtbproject.com/trail/592585)! The Monitor-Merrimac trail is about a 5.5-mile loop trail that is on BLM Land that is free to use. The slickrock isn’t actually slick for mountain bikers, but it does make for some very fun mountain biking! 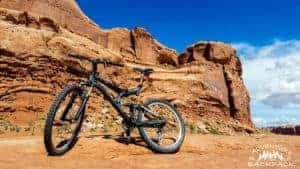 Whereas Slickrock Bike Trail is probably the most popular mountain bike trail in Moab, it is not a beginner mountain bike trail. It also costs $5 for the day, whereas BLM Land is always free. Five dollars adds up over many adventures, and we prefer to frequent free activities as often as possible! Overall, we had a blast on this trail. It was challenging enough for a beginner mountain biking trail, but still not something that we couldn’t manage. The tough parts were mainly navigating the bits of sand and some narrow trails near a creek, but overall it was a great trail with a lot to offer. It was definitely fun for mountain bikers of all ages! Also, at the end of the trail (if you are going clockwise, which we highly recommend), there is a gravel parking lot that leads to a dinosaur fossil trail. We will talk more about it in another post (check it out HERE), but we do highly recommend taking the extra few minutes to hike that trail! Dog Friendly: Appears to be moderately dog-friendly (BLM land); however, we left ours at the RV as they have never been mountain biking with us. We like your video and tried to ride M&M today but we parked at the gravel lot where the dinosaur fossil trail is at. Can you tell me more about where you parked and started this trail as we struggled today to get towhere you all were riding but there has been rain and a lot of wash out too.